There is a memorial in Sutton Parish Church to Hugh Harman, who died in 1528. 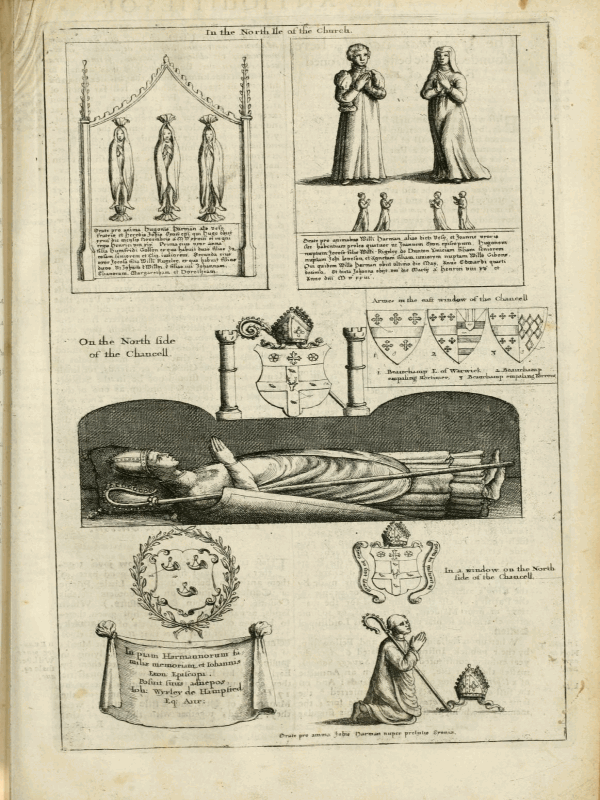 He was the brother of Bishop Vesey, and father of eight of the Bishop’s nieces and nephews. Hugh’s first wife was Ann, daughter of Humphrey Golson, a local gentleman who held various offices in the area, including Keeper of Sutton Park, a post given to him by the Duke of Clarence, and for which he received twopence a day (£3.0s. 8d. per annum). His second wife was Joyce, daughter of a local squire, William Rugeley of Dunton; her grandfather had held the post of Forest Rider of the Chase of Sutton Coldfield at five pounds per annum. Both these ladies were of good family, perhaps slightly above Hugh’s status when he married them in the 1480s and 90s. Hugh married before his brother had become a powerful and wealthy magnate, but by the time Hugh’s children reached maturity John Vesey was Bishop of Exeter, living in palatial New Hall, and in favour with King Henry VIII; his nieces and nephews could all expect to marry well. By 1524 the two daughters of Hugh’s first marriage, Joyce and Eliza, were married into gentry families, and John Harman, eldest son of the second marriage, was married to a Buckinghamshire heiress, living at Moor Hall with his younger sisters. It was time to find a husband for the eldest girl, Joan; Bishop Vesey and Hugh Harman decided that George Middlemore would be the lucky man. The terms agreed were that John Middlemore Esquire would convey his manor of Haselwell (at Stirchley, now in south Birmingham) to Bishop Vesey and others in trust for George and Joan, in return for £400 paid to him by Bishop Vesey, a very substantial sum. It is not known what Joan thought of this - the agreement is that the wedding should take place before June 1526 “if Joan will thereto assent and agree” as though Joan had not been consulted. According to another clause, if Joan were to die in the meantime, George would marry one of her sisters - a purely commercial transaction. Joan’s sisters all made equally good marriages, no doubt arranged with a handsome dowry from the Bishop. Eleanor married the wealthy Robert Pudsey of Langley Hall, Sutton Coldfield; Richard Sheldon, another wealthy landowner, married Margaret, and Dorothy married Thomas Wyrley of Hamstead in Handsworth. In 1748 a descendant of Dorothy, Sir John Wyrley, restored the monument to Bishop Vesey in the parish church. 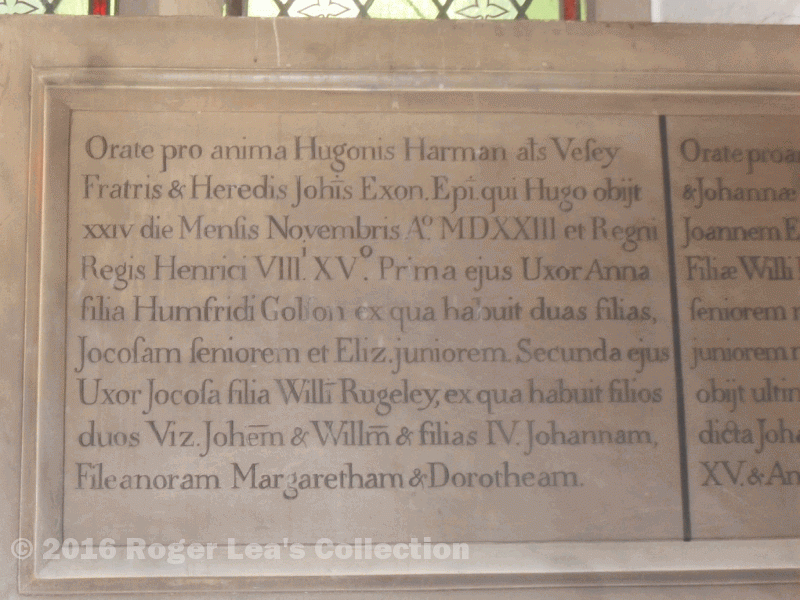 Joan’s marriage settlement, signed by Hugh Harman, is dated 1525, but the memorial tablet to Hugh Harman gives the date of his death as 1523. Riland Bedford, in his History of Sutton Coldfield, 1890, says that this tablet is a copy an earlier inscription which, although it no longer exists, is illustrated in Dugdale’s Antiquities of Warwickshire, 1656. The illustration gives the date of death as MDXXVIII, 1528, but the copy misses out the V, MDXXIII. Hugh is described as the brother and heir of Bishop Vesey, and was still named in Vesey’s will when he died in 1554, but it was not Hugh who inherited Vesey’s property but Hugh’s grandson Thomas Harman.